New ships, new challenges, 100 new wormhole systems and spiffier visuals. 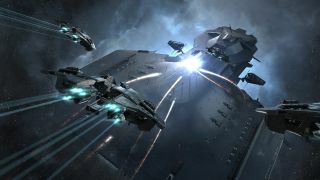 That's what EVE players are getting in Rhea; the game's sixth—and, according to CCP, biggest—major release of this year. The above main features are rounded up in a new trailer touring people through the update. Of the 100 new systems, one, named Thera, is billed as a "location unlike any other in the universe". CCP describe it as, "home to four fully-equipped stations with a staggering amount of entry points. At over 340 astronomical units (AU) end to end, it is unparalleled in size and scope." In addition, players will have access to a new UI, and new ship control system. You can see a more detailed run-down of the release's content over at the Rhea release page.